Completing the Free Application for Federal Student Aid is a vital step in getting help to pay for college. By attending FAFSA Frenzy on January 30th students and families can get free, expert help in filling out this important form. FAFSA Frenzy will take place from 1-4 p.m. January 30, at Eastern Wyoming College in Torrington and at the EWC Branch Campus in Douglas. At the FAFSA Frenzy, financial-aid professionals – primarily from Wyoming postsecondary institutions – will provide assistance in completing the FAFSA. College-bound students must complete the FAFSA to qualify for federal and state financial aid, as well as scholarships and grants offered by many colleges, universities and vocational/technical schools. Students 23 years of age or younger should attend the FAFSA Frenzy with their parents or guardians and bring their parents’ and their own completed 2010 Internal Revenue Service 1040 tax returns, if available, or W-2 Forms or other 2010 income, asset and benefits information. If parents cannot attend, students may attend alone, but they must bring the same income information. Students 24 years of age or older may attend alone and bring their own completed 2010 IRS 1040 tax returns, if available, or W-2 Forms or other 2010 income, asset and benefits information. Everything else — including pens, pencils, FAFSAs and snacks – will be provided. 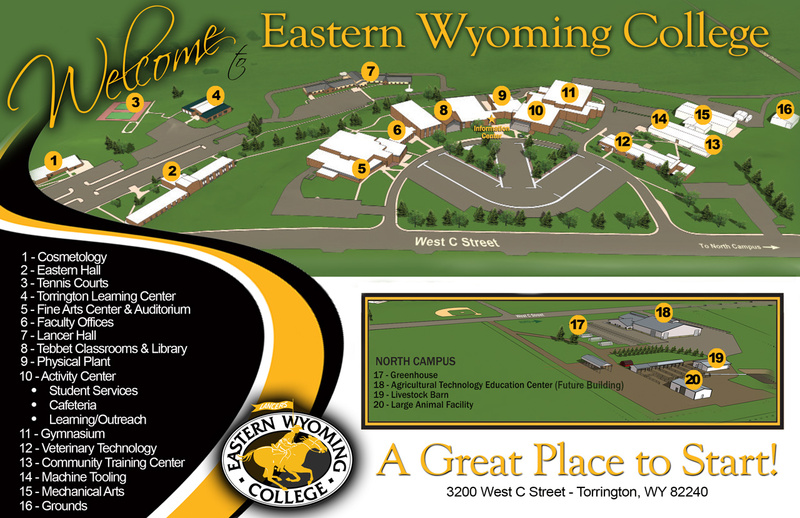 Sponsored in part by: Eastern Wyoming College, EOC, and the University of Wyoming. Visitation Day gives students the opportunity to tour the campus. Students can meet with instructors and coaches, visit a class and try out for volleyball. You can also find out more about EWC scholarships, financial aid, and housing. Registration begins at 8:30 a.m. and the sessions run from 9:00 a.m. to 4:00 p.m. with lunch provided. Two $250 book waivers will be given away during Visitation Day courtesy of the EWC Foundation. For more information please contact Mell Cooper at 307.532.8237 or e-mail him at mell.cooper@ewc.wy.edu. You can also register online at ewc.wy.edu. The Eastern Wyoming College Foundation will be holding the fifth annual Sagebrush and Roses event. This black tie and blue jean gala will be held on Saturday, January 29th at the Rendezvous Center at the Goshen County Fairgrounds in Torrington, Wyoming. This event features an elegant evening of dinner and dancing. Music will be provided by Wyoming band Chancey Williams and the Younger Brothers. This event also features an invitational exhibit by regional western artists. The addition of an art show began last year and continues to gain momentum at this popular regional event. Tickets must be purchased in advance and are $60 each. Tickets are available by contacting the Institutional Development office at Eastern Wyoming College at 307.532.8397. Funds raised at Sagebrush and Roses continue to support the agriculture and livestock judging programs at the College. Funds are also used for student scholarships. A large number of students majoring in agriculture related programs and participants from the livestock judging team will be the servers for the evening. Eastern Wyoming College invites the community to attend a community appreciation night at the Lancer basketball games on Friday, January 7th. There will be free admission and popcorn to all who attend. The women’s game begins at 5:30 and the men’s game is at 7:30. The Lancers will be playing Casper College.